This morning, I used my slow cooker to braise a leaned pork dish (a lower-fat version using lean meat), before I left for work. Just put in all the ingredients and seasoning, set fire to low. By the time I reached home in the evening, the aroma of braised meat filled the entire house when I opened the wooden door. I like to use my slow cooker. It makes cooking much simpler, tastier, healthier (with lean meat) and less hassle! Using a slow cooker to braise the meat, you won’t need to spare your precious time looking after the stove for a dish which requires long cooking time. No worries, your dish will not loose the moisture as long as set cooker to auto shift/ low, even turn it on as long as 10 hours! In fact, this recipe I have, is more like a soupy kind of braising method than the thick gravy type. A 3.5 liter slow cooker uses 200V – 50Hz, normally. Braising pork at home can be as delicious as selling outside. Most importantly, it’s surely healthier as you can control the food ingredients and seasoning used. I used lean meat instead of pork belly. Belly part is definately nicer, especially with the layer of fat added into the gravy, the taste can be even better… However, I prefer lean meat, still. Less cholestrol, less fat, and lean meat will take a load off your waistline and “spare tyres” (chuckling). Calories of one decent portion of braised dish with my recipe count about 350kcal. Just to let you know, for sure cooking with pork belly parts yield tastier and more springy texture of the meat, but it’ll also double up the calorie count (smiling)! 1) Marinate pork meat with light soy sauce and rice wine, for at least 15min (I marinated them overnight since I prepared it in the night before for next morning’s cooking). 2) Add all ingredients (i.e. marinated meat, mushrooms, hard-boiled eggs, tau gua, and seasoning) into the croak pot. 3) Set cooker to auto-shifted or low. Leave it till you are back from work (as long as 10 hours). The tender and juicy meat and mushrooms are all ready to serve. 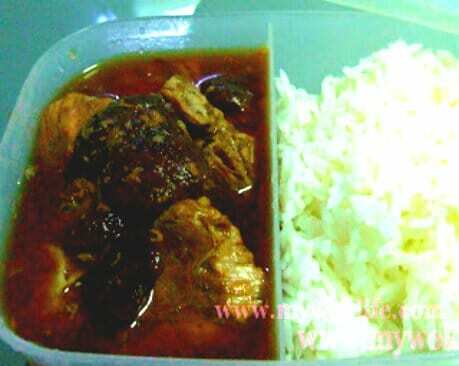 4) Serve with hot steamed rice or plain bun aka “Man Tau” (馒头). 1) Heat a pot with 1 teaspoon of oil over medium-high fire. Stir-fry the minced garlic with wooden spoon, until fragrant. 2) Add marinated pork and mushrooms, stir-fry for 3 min, or meat lightly browned. 3) Add in water, and all other seasoning. 4) Reduce heat to low, simmer for 3 hours, or until meat and mushroom are tender and well braised. Serve hot. Some said braised meat will become even tastier and more intense flavour, if you keep and cook it again the next day, for “double braised” effect, I believed so. Perhaps, you can keep the balance (if cannot finish in a meal) in refrigerator, and reheat it for next day’s lunch box (smiling). Tips: I used lean hind part for the meat, and Chinese flower mushroom (花菇) in this dish. * Braising time with slow cooker is varied. It’s not necessary to braise for 10 hours long, long as long as the meat is tender and well braised. Generally, it takes approximately 4 – 5 hours. 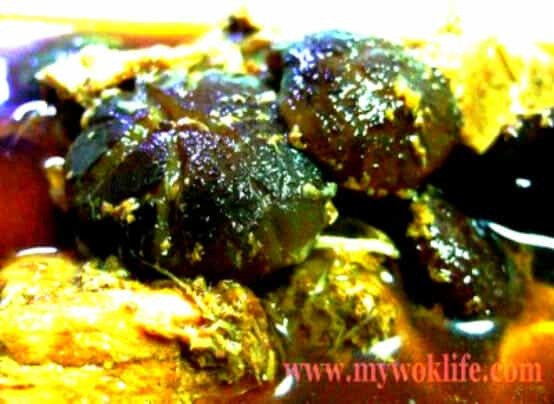 *If you intend to cook this as 1-dish-meal, add other ingredients such as Asian dry beancurd (Tau Gua), hard-boiled egg, and button mushrooms to make this dish fuller and more varieties. *I prefer lighter colour for the gravy. So, I reduced the amount of dark soy sauce by half. *If you find the gravy is too watery, just thicken it with 1 teaspoon (added into 1 tablespoon of water) cornstarch made into slurry. The actual recipe should not be much water added as you want the flavour of the gravy to be thicker.. But again it is all depends on your liking. Add more water if you like. I think water amount that enough to submerge all the meat is good enough.